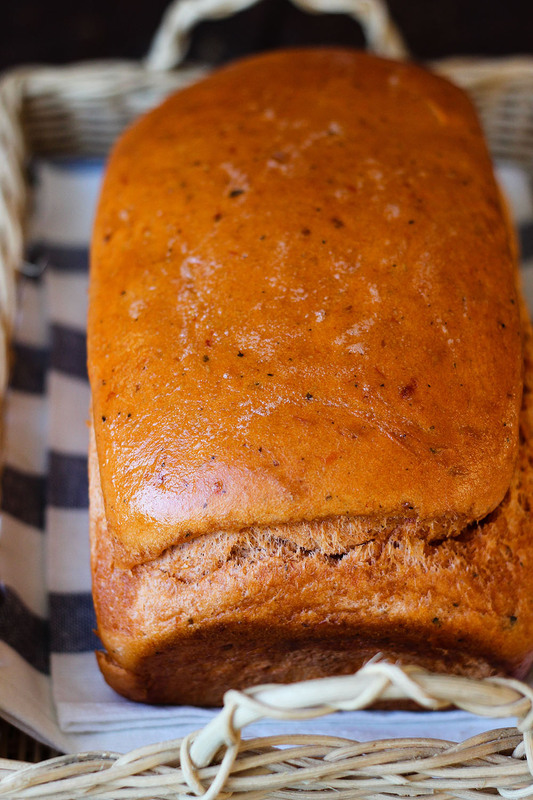 Imagine this bread with a vegetable pasta salad or as a pepperoni and cheese sandwich - toasted! *Amount of bread flour will vary with each brand of spaghetti sauce; see directions below. Place spaghetti sauce, Parmesan cheese, 3 cups bread flour and yeast in bread pan. Select White or Basic cycle and start machine. Keeping the lid of the machine open, gradually add enough of the additional bread flour until mixture forms a smooth, soft ball. Close lid. When baking is complete, remove bread from machine as soon as possible. Cool on rack. See our Bread Machine section for more helpful tips and information. You can substitute Instant (fast-rising) yeast for Active Dry Yeast. Traditional methods- replace 1:1. Expect your dough to rise faster; always let your dough rise until ‘ripe’. Bread Machines- use ½ tsp Instant yeast (or ¾ tsp Active Dry yeast) per cup of flour in your recipe. Update: To make bread by hand: Warm the spaghetti sauce to 120-130°F. Add 3 cups flour, yeast and cheese to mixing bowl. Whisk to combine. Stir in the warm sauce, adding additional flour until you get a soft dough that comes together. Turn out dough onto floured surface. Knead dough until smooth and elastic (about 5-7 minutes). Let rise in greased bowl, covered with towel or plastic wrap, until doubled in size. Punch down dough. Shape into loaf, place in greased bread pan; cover and let rise until finger indentation remains after lightly touching. Bake for 25 minutes at 375°F. Let cool on wire rack, slice and enjoy! You can select dough cycle and remove dough after 1st rise. Then shape into loaf, place in greased bread pan, cover and let rise until finger indentation remains after lightly touching, bake for 25 minutes at 375°F. Let cool on wire rack, slice and enjoy! Do you think it can work with Spelt flour, instead of the bread flour? Spelt flour doesn’t have the same gluten-forming properties as bread flour. You can start out subbing in 1/2 cup of spelt flour with 2 1/2 – 3 1/2 cups bread flour. If that works well for you, try increasing to 1 cups spelt flour. Let us know if you try it! I only hope it would hold up with the panini maker. I’m gonna try this tomato basil bread and make it by hand. We have a bread maker but we haven’t used it in years. And it may or may not work. I pulled out the juice man juicer today and it too hasn’t been used in ages! Of course, no go. Can I make Tomato Basil Bread by hand using same ingredients as shown? Do I preheat the oven? Yes, you can make the bread by hand. Warm the spaghetti sauce to 120-130 degrees F. Add 3 cups flour, yeast and cheese to mixing bowl. Whisk to combine. Stir in the warm sauce, adding additional flour until you get a soft dough that comes together. Turn out dough onto floured surface. Knead dough until smooth and elastic (typically 5-7 minutes). Let rise in greased bowl, covered with towel or plastic wrap until doubled in size. Punch down dough, and follow directions in the notes section.